Photojournalism is storytelling in pictures. A single photo tells a single event. The frozen moment, in the best photographs, radiates through time in both directions, past and future. Those photos that freeze a significant moment are rare. Those that capture a moment and also a time, a place and an era are very rare. We all have our own mental rolodex of those photos. The naked child, burned and crying, running down a dusty road in Vietnam; the wailing woman kneeling over a student shot at Kent State; police dogs tearing at a black protestor's clothes; a soldier shot in the back, his arms spread to the horizon, falling to his death. Those photos were made famous because they captured one instant and an entire era. They are important because they record a significant event, but they are remembered because they resonate on the meaty side of our ribcage like a timpani drum roll capped with a sonic boom. The photos here at the Light Factory, in an exhibit titled Women In Photojournalism, don't do that. There are significant events documented here -- a communion, a baptism, a wedding, a war -- but the photographs on these walls don't deliver the requisite impact to permanently imprint the event on my rolodex for all time -- they don't radiate far beyond the picture frame through time or space. But I will mentally shoplift and index a few of these images for later recall. Here are the most memorable. "A Wife's Scent" by Cheryl Diaz Meyer of the Dallas Morning News shows a US Marine stealing a moment away from his mission in Iraq to inhale the scent of a woman. With his head bowed and his eyes closed, the edge of his helmet and his nose gently touch the stationary, the first missive sent from his wife. We secretly share his sense of distant memory made painfully palpable as he escapes into a sensory recall no written word can rival. His reverie is our reverie. His private moment is captured by the camera and made public. We benefit. The quality of the photograph puts us there. The idea is as old as war -- anxious separation and longing relieved briefly through a momentary trip home. The photo banks on the easily identifiable emotion the soldier feels. We all know a piece of this man, empathize with the balm of his quiet memory and his tiny flight away. I connect. Though I have never fought in a war, I have taken solace from fear through memory. Though I've never feared for my life in a foreign land, I have taken momentary flight triggered by a remembered scent. A good photograph wrestles emotion from us and then provokes thought. This photograph elicits my empathy for the man and stokes my ire for those who put him there. I connect, and remain grateful for the real distance between us. Each morning I check the photographs in the sports section first. Sports are the most likely moments to capture human engagement unscripted and unchecked, the instant come and gone in the blink of a shutter. The best, or the luckiest, photographers capture these instants of exhilaration or despair. Rebecca Gratz of Ball State University caught one. A high school softball game ends with the catcher hugging her relieved and ecstatic teammate. The pitcher's face is what delivers the photograph. With mouth wide open and eyes shut, the girl bellows as she is wrapped up in the arms of her teammate. Hers is the face of fleeting sports ecstasy, a vision we have all seen before, will see again, and of which we will never tire. It's as alluring and enduring as a child's unsolicited smile. Christine Rucker from the Winston-Salem Journal shows another face of childhood. An infant lies in a makeshift hospital in Panama City, Panama. Her hospital bed is a wooden crate in a cinderblock hallway. The infant lies prone and motionless as her 10-year-old sister pumps a respirator to keep her alive. The older sister cradles the small pump in two hands and works rhythmic puffs with her thumbs. The photo captures the girl glancing over her shoulder, down the hall away from her work. The expression on the girl's face is vexed and desperate, like an unspoken reply to an elder's exhortation: If you stop, your sister will die. She's doing the life-saving work we Americans routinely relegate to a machine. The worry and fear in her face ages her with every moment; the life she is pumping into her sister's body appears to be her own. A photograph can capture and characterize a generation, an agenda or a jackass. A photograph by Nancy Kaszerman of Zuma Press manages to do all three. 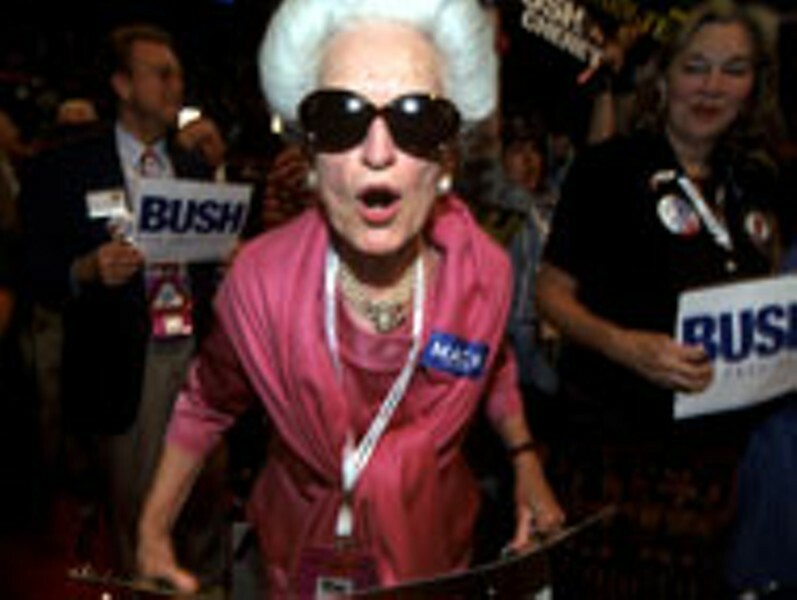 In "Women In Politics," a very old blue-haired woman wearing oversized sunglasses howls into the camera from the floor of the Republican National Convention in Philadelphia. Her face would be frightening from two feet but now she's three inches away. Two delegates behind her carry chest-high signs: BUSH for President. The howling woman wears a phosphorescent nylon vermilion dress and totes 12 pounds of pearls around her neck. She is the hollow and desiccated rant of the bellicose Republican Right made flesh, the poster child for the Evil Empire at home. Then there is the photograph which illustrates the human condition as not yet corrupted -- as still robust, vibrant and beautiful. Jennifer Roenizer of the Winston-Salem Journal shows a 15-year-old South Carolina boy toting a 30-pound bundle of freshly cut gladiolas. He walks barefoot through warm mud, harvesting flowers for pocket money. What he is doing, who he is, where he's going is less important here than the simple unsullied presence beaming from this boy's guileless and innocent face. He's got friends in the field, the sun on his back, his whole world is laid out in front of him like a promise he can keep. He is unselfconscious, enviable bliss. Yeah, yeah, yeah, it's romantic and corny. A bygone American boyhood made mockable by hucksters like Ralph Lauren and Abercrombie and Fitch who have co-opted this All American image to sell atmosphere you can wear on your back or pour from a bottle. I can only hope Tommy Hilfiger doesn't send a scout down to River Glads Farm in Kingstree, SC. That would doubtlessly transform this boy's quiet celebration of life, already as fragile and transitory as a perfect late summer afternoon, into a loud and bloodless celebration of Self. The exhibit Women in Photojournalism will be shown at Spirit Square through October 11. Showing concurrently is Grampa, a series by William Tolan that documents the last years of Mr. Tolan's grandfather's life.